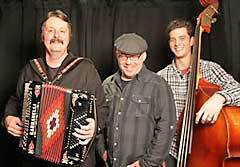 The Howlin’ Mudbugs bring New Orleans music to Baldwin’s Station on Mar 21, 2013. Posted on February 2, 2013, in Baldwin's Station and tagged accordion, Howlin' Mudbugs, New Orleans music. Bookmark the permalink. Comments Off on The Howlin’ Mudbugs bring New Orleans to Baldwin’s Station, March 21.